DON'T YOU FORGET ABOUT GHEE The '80s hits wafting in just make all the well-slathered food at the Sherpa better. It's a warm and smoky day in St. Helena, and Main Street is a-bustle with shoppers and hungry sub-sherpas fresh from the winding St. Helena Road, looking for a good lunch and sporting the latest in fashionable face masks. Paradise is ablaze with the Camp fire, everyone's got bronchitis, and life goes on. The sun is shrouded in smoke but the day is otherwise lovely. Me and the dog grab a table near the sidewalk on the outside courtyard at Himalayan Sherpa Kitchen and tune in to our noisy surroundings. The restaurant's located in the St. Helena Plaza, right in the heart of the downtown commercial district; the plaza also hosts the St. Helena Bistro next door to the Sherpa, from whence the 1980s hits just keep on coming off the outdoor sound system and bleed into the Sherpa's courtyard. "Don't you forget about me," I sing to my weird and hairless dog as the friendly waitress drops off a menu and a water bowl for the pooch. "Hey, hey, hey, hey, oooo-oohh-ohhhhh," I sing, upon a full investigation of the lunch specials menu by way of the accompanying Breakfast Club soundtrack. We scan the menu. There are tandooris and curries of a meaty and veggie variety, and all the expected items you'd find on a restaurant serving Indian and Nepalese food—pakoras and samosas, saag paneers and various vindaloos. It is said that the key to happiness is to always have something to look forward to—so next time I'm here, those momo-steamed dumplings are at the top of the list of to-orders. But today, I settle on the tried and true, my Indian food go-to dish—the chicken tikka masala special, served here on a metal compartmentalized platter with buttery naan, a side of broccoli, rice peppered with peas and a wee bowl of cool lentil daal. Advertised as a "smooth creamy sauce," the tikka masala delivers on the sentiment; it's a super-buttery sauce with a tinge of curry spice and dotted with a generous portion of moist and organic chunks of chicken. The tikka masala appears to be engaged in an epic battle to out-butter the buttery naan, which is also quite buttery and tasty. Dipping the buttery naan into the buttery tikka masala, I'm reminded of the sacred cows of India. Would they approve of such richness? In a nod to local product, the Sherpa Kitchen also offers a few vegetarian and tofu-based tikka masalas, along with a salmon-based version. I'll try the lamb next time I'm out this way. The lunch special also comes with a pile of small broccoli flowers distinguished by their absolute lack of distinctive flavor, beyond a lightly charred backbite and perhaps a bit of salty attitude. I dropped the broccoli bits into the rich and dense yellow sauce and all my problems were solved. Well, most of them, anyway. "Yo." The dog was looking at me with those pleading eyes. "Well, dog, you're not getting a sauce-soaked chunk of chicken, OK? It's way too spicy for you." "C'mon, man!" Those pleading eyes again. I relent. I pour a little water from my glass onto the metal tray and rinse the sauce off the last of the chicken, and feed it to the dog. And then, despite him egging me on, I resist the temptation to lick the metal tray dry of the last remnants of that rich and homey special sauce. 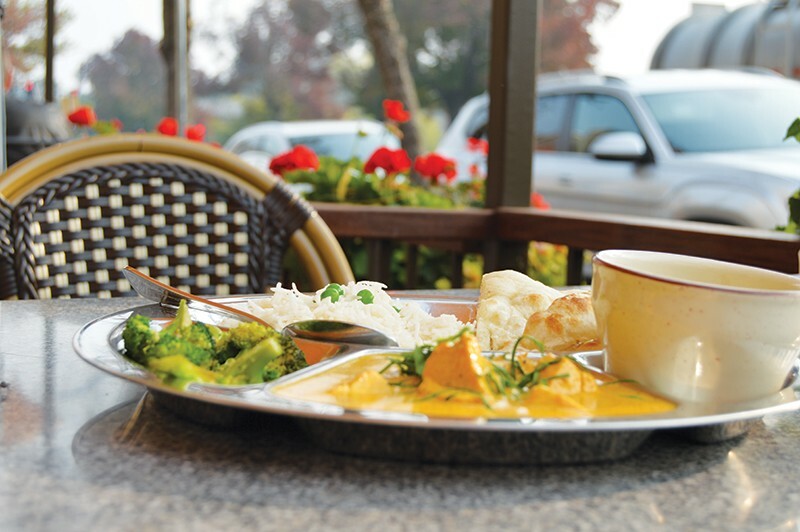 Himalayan Sherpa Kitchen, 1148 Main St., St. Helena. 707.963.4439. Open every day for lunch and dinner except Tuesday.